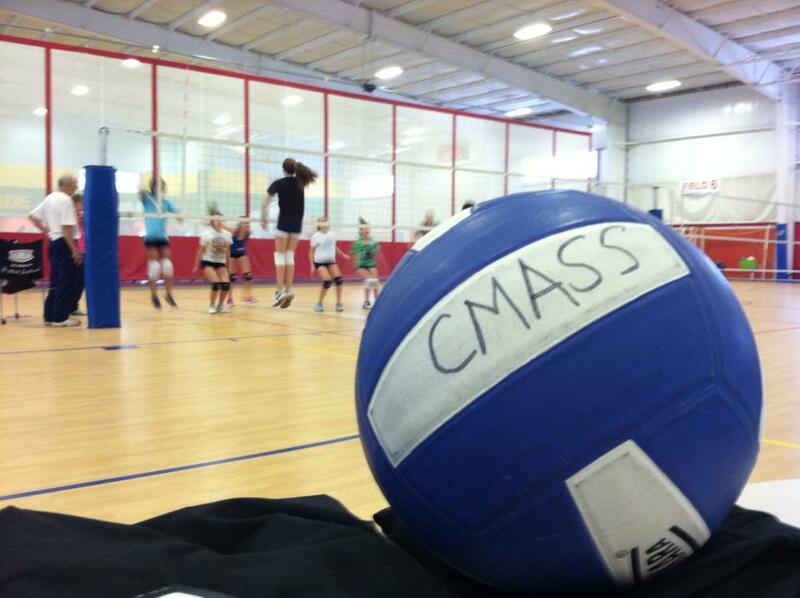 CMASS Juniors will hold tryouts for Tier 3, 2, and 1 teams in November and December. Our In-House Program requires registration but not tryouts. Please read the details of the tiers carefully. If you can commit to the time commitment and cost of the program and believe you can compete at that level, we welcome you to tryout. Players should attend all age appropriate tryouts for the best chance of making a team. If you can’t make a tryout, please let us know as early as possible. The final session is mandatory (unless excused by a coach) so that final teams may be formed. Due to the increasing number of players participating in tryouts, CMASS will hold a ‘Skills Rating Session’ before tryouts start. Players will need to attend these sessions, as call-back lists will be posted for players invited to tryouts. Additionally, inter-tier and court movement will occur during each tryout, and call back lists will be posted after the first two tryouts(for Tiers 2, 2+, and 3) and after the second tryout (for Tiers 1+ and 1). This will be done as soon as decisions are made in order to give every player the opportunity to be evaluated appropriately for the next tier. Players called back for the third tryout (Tiers 2, 2+, and 3) will need to bring a $150 team deposit in the form of a check. This will be non-refundable and applied to the total season cost if a player is selected to a team, or returned if a player is not chosen for the team. 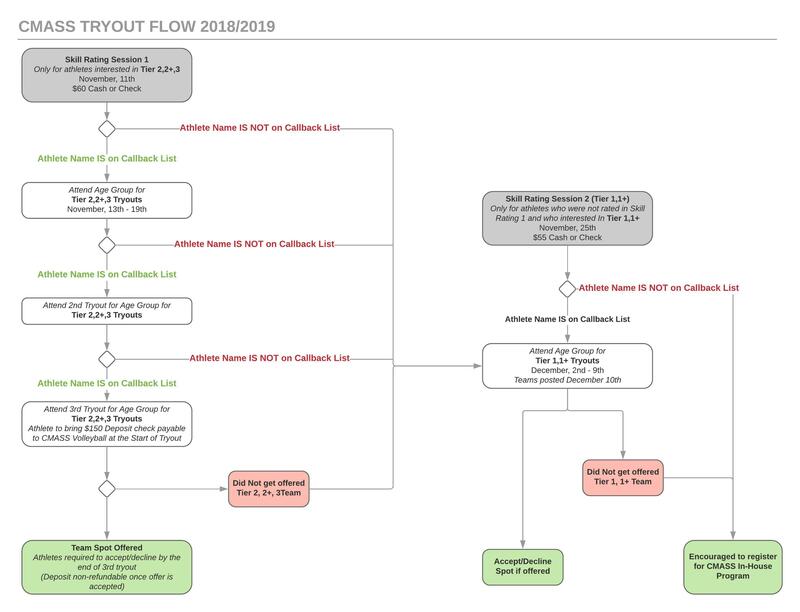 Please click the ‘tryout flow chart’ link below for further information. Players who are not placed on Tier 3 or Tier 2 teams are welcome to tryout for Tier 1 teams at no additional cost. Players who are not placed on any teams are welcome to register for the In-House program. What do I need to do to tryout? 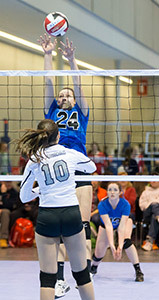 Please register & pay online for a USAV/NERVA membership, listing “Central Mass” as your team. Having players pay this fee directly is a USAV requirement. Bring the USAV/NERVA membership card print out from your USAV membership account. Checks made payable to Central Mass Juniors Volleyball Club. Show up to the gym 30 minutes prior to tryout. Bring water so you don’t lose any court time. Show us how good a volleyball player you can be and don’t be afraid to make mistakes – we’d rather see you try hard. Volleyballs, net systems, medical kits, etc.